Liverpool defender Virgil van Dijk was booked in the first half of his side’s Champions League clash with Napoli, and Carlo Ancelotti was convinced he should have seen red. As seen in the video below, the Dutchman clearly wins the ball first, but his follow through catches Dries Mertens who was fortunate to escape a serious ankle injury. Referee Damir Skomina deemed it worthy of a yellow card, but as noted by Sky Sports, Ancelotti believes that had VAR played a part, as it will do in the knock-out stage of this year’s competition, it could have led to a Van Dijk red card which would have changed the entire complexion of the tie. However, the Liverpool man has defended his tackle and didn’t see anything wrong with it. “I don’t think it was a bad challenge at all,” Van Dijk said, as quoted by ESPN. “Unfortunately I touched him, but I would never go in to hurt him or anything like that. Liverpool went on to secure a 1-0 win and advanced to the knockout stage of the Champions League at the expense of Napoli, who now drop down to the Europa League. 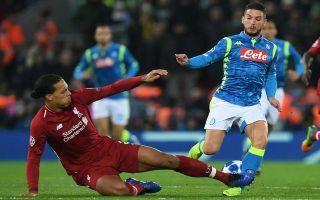 VAR will undoubtedly help cut out controversial moments in games moving forward, but on this occasion, it appears as though Ancelotti and Van Dijk will have to agree to disagree on his tackle on Mertens and the severity of the punishment that he got. The Reds did suffer a smaller setback though as a result of that caution, as Van Dijk will now miss the first leg of their last-16 encounter.